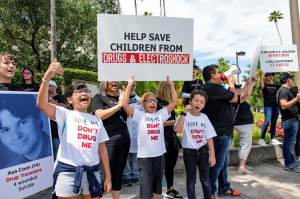 The Citizens Commission on Human Rights held a demonstration at the Florida Psychiatric Society conference protesting the drugging of children. These alarming statistics prompted the Citizens Commission on Human Rights (CCHR), a mental health watchdog dedicated to the protection of children, to stage a demonstration at the Florida Psychiatric Society conference in Orlando this past weekend. Marching through the streets with signs reading “Childhood is not a Mental Disorder” and “Psychiatry Drugging Children for Profit” hundreds of men, women and children made their voices heard in order to raise awareness on the labeling and drugging of children. “The labeling and drugging of children with psychiatric drugs that come with very dangerous side effects and the widespread violence in our schools and communities needs to be investigated,” stated the Florida president of CCHR, Diane Stein. About CCHR: Initially established by the Church of Scientology and renowned psychiatrist Dr. Thomas Szasz in 1969, CCHR’s mission is to eradicate abuses committed under the guise of mental health and enact patient and consumer protections. L. Ron Hubbard, founder of Scientology, first brought psychiatric imprisonment to wide public notice: “Thousands and thousands are seized without process of law, every week, over the ‘free world’ tortured, castrated, killed. All in the name of ‘mental health,’” he wrote in March 1969. To learn more, please call 727-442-8820 or visit www.cchrflorida.org.